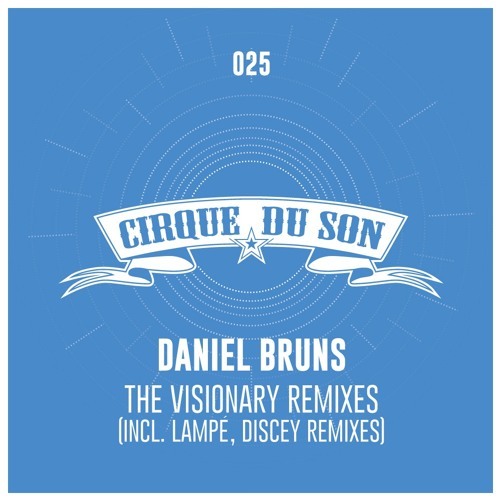 After two dozen releases Cirque du Son is celebrating the summer heat with the small unofficial anniversary of their 25th release Daniel Bruns - The Visionary Remixes (incl. Lampé & Discey Remixes). Labelhead and sonic visionary himself, Daniel Bruns delivers a beast of a pumping summer tune that will be stuck in your head for ages. With irresistible feathery arpeggios and it’s pushing groove “The Visionary” has already been growing wings on many of this summer’s dancefloors and stirred a big appetite for the additional remixes. Discey infuses his re-interpretation with the sun drenched vibes of his eivissan home of choice and wraps the timeless theme in pure summer joy. Rounding off Cirque du Son’s 25th release, talk-of-the town and up and coming talent Lampé further deepens the plot by embellishing the track in the dark sonic cloak of his trademark nighttime deeptech sound.